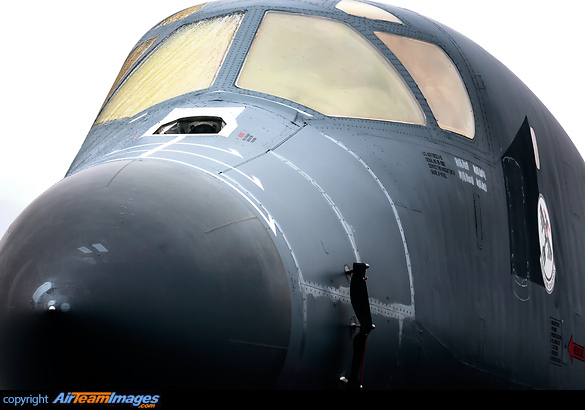 The B-1B Lancer is a strategic long-range heavy bomber used by the United States Air Force. It can rapidly deliver massive quantities of precision and non-precision weapons against any adversary, anywhere in the world, at any time. The B-1 Lancer can carry the largest payload of both guided and unguided weapons in the United States Air Force inventory. 4 x General Electric F101 (30000 lbf) turbofan engines. 24 GBU-31 GPS-aided JDAM (both Mk-84 general purpose bombs and BLU-109 penetrating bombs) or 24 Mk-84 2,000-pound general purpose bombs; 8 Mk-85 naval mines; 84 Mk-82 500-pound general purpose bombs or 12 AGM-154 JSOWs.